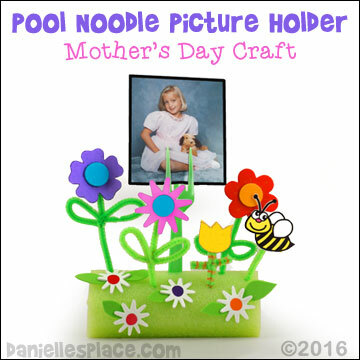 This craft makes a great keepsake for moms! 1. Cover your working area with newspapers or a drop cloth. 4. To finish have your children write a "toe-tally awesome" saying on their papers, and then add smiley faces and other embellishments. You may also want to frame the picture. 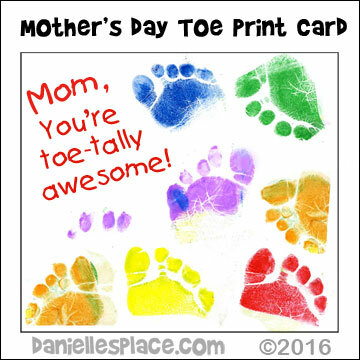 Mom, I'm toe-tally crazy about you! Mom, I Love You Toe-tally! Watch Logan, his dog, and new baby brother help Dad make this Mother's Day card. You can watch this video on Logan's Life on Youtube. 1. Print out the flower, bee, and bird patterns onto card stock if you are going to use them. Have your children color them and cut them out. Highlighter markers work best. 2. Cut the noodle into six-inch pieces with a serrated knife. Then cut slivers off the sides of the pieces to make a flat side on each piece. 3. Place the piece of noodle on a flat surface, cut a slit in the top, and poke a fork into the slit so that it sticks up straight. 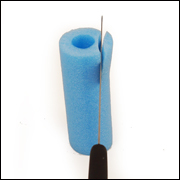 Use the fork tines to hold a picture or card with a note to the child's mom on it. 4. Have your children decorate the noodle with chenille stems, craft foam flowers, and/or the paper flower, bee, and bird shapes. Show them how to bend the Chenille stems into stems and leaf shapes and glue the flower shapes to the top. ©2016, Digital by Design, Inc. This craft uses foam flower stickers and a low temp. glue gun to achieve a 3D effect. If you have younger children that should not use a glue gun, you can just have them layer the stickers to make the 3D effect. 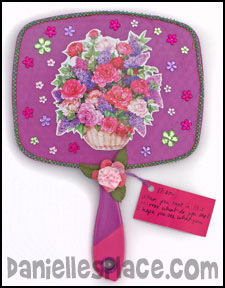 Children can attach a note to their flowers that say, "Mom, thanks for helping your little bud bloom." on the front. On the back of the note it says, "Bud - an immature or undeveloped person. Bloom - to flourish or thrive. 1. Find three or four foam flower stickers and a pom pom that look nice together and that can be layered on top of each other. 2. Start by making the center of the flower. If you are using the type of flower with wide petals, you can make the petals look curved by gluing the base of the petals together. Glue one petal at a time. Place a small dot of glue with a low temp. glue gun at the base of the petal. Squeeze the sides of the petal together until the glue cools. Once you have glued the petals you can glue a pompom in the center of the flower. Make the next layer the same way or use a different type of flower. 3. If you don't want the petals to curve up, you can just glue a pom pom to the center of the flower and then glue each petal up to the sides of the pom pom. Add another flower to the bottom of that flower. By gluing the center of the flower to the bottom of the first flower. Place a dot of glue on each petal and glue it to the under side of the first flower's petals. 4. Cut leaf shapes from the craft foam and glue them to the back of the flowers. 5. To make the stem, fold a pipe cleaner in half and wind one end of the pipe cleaner into a circle and glue it to the back of the flower. Wind one half of the pipe cleaner around the other and glue the end to the bottom of the flower. 6. 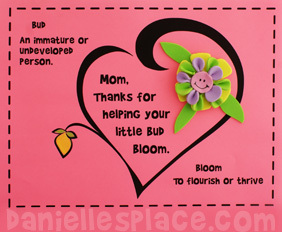 Make a note on a 3/4" by 3" sheet of paper that says, "Mom, thanks for helping your little bud bloom" on one side and "Bud - an immature or undeveloped person. Bloom - to flourish or thrive" on the other. Punch two holes in one side and thread the stems through the holes. Children color the activity sheet and glue on craft foam or silk flowers. This craft is available to members. 1. 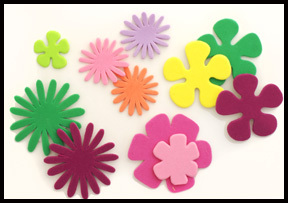 Cut bookmark shapes from craft foam 2 1/2" by 8" is a good size and decorate them with 3-D flowers, gemstones, feathers, and foam shapes. 2. To make the laced edges punch holes about 3/4" apart all the way around the border. Cut foam into 1/4" wide strips and lace them through the holes. 3. 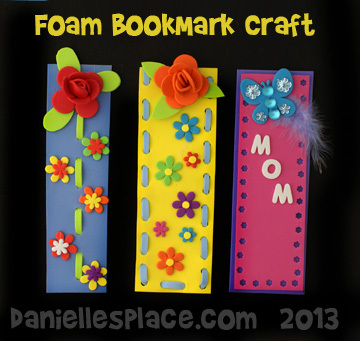 To make the fancy hole-punched border punch flower shapes or other pretty shapes all the way around the edge of the bookmark and then glue another, slightly larger piece of foam to the back of the bookmark. 1. To make the leaves cut pipe cleaners into five-inch pieces and bend them in half. Glue them to the back of the 3-D flowers. 2. To finish stick adhesive bar safety pins to the back of the flowers. 1. Cut a piece of cardboard the size you would like your frame or use a pre-made frame. 2. Spread a thick coat of tacky glue all over the frame. 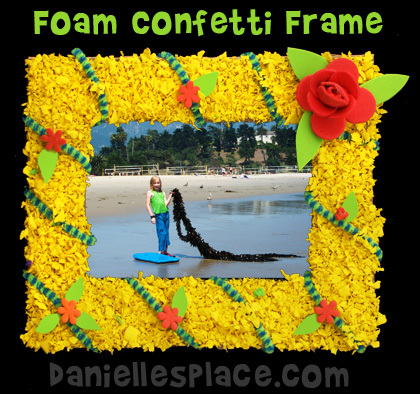 Place the frame on a piece of paper larger than the frame and drop the confetti over the frame so that it completely covers the glue. Press down on the confetti to stick it to the frame. 3. After the glue has dried pick up the frame and tap it on the piece of paper. Use the piece of paper to place the unused confetti back in the bag. 4. Wrap striped pipe cleaners around the frame and glue or tape them to the back of the frame. 5. Cut leaf shapes from green craft foam and glue them to the frame. Glue foam flower shapes near the leaves. 6. To finish glue a picture to the back of the frame. 1. Paint the boxes with acrylic paint and let them dry. 2. Bend a pipe cleaner into leaf shapes and glue it to the top of the box. 3. 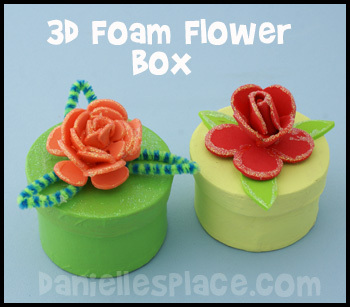 Glue a 3-D foam flower on top. 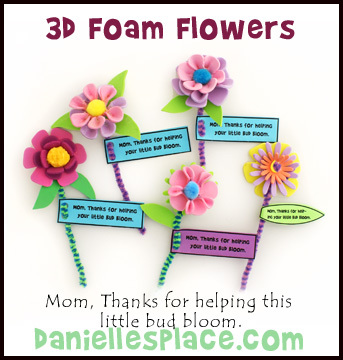 You can make your own 3-D flowers by gluing foam flower stickers on top of each other. The petals were overlapped and glued together more and more for each layer. 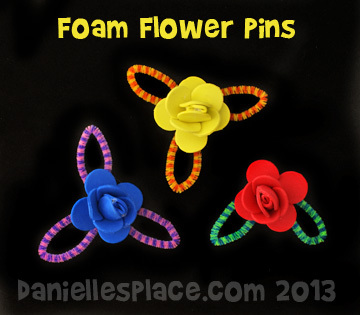 The flower stickers used are Darice Foamies Blacklight Flower Stickers. 4. Add glitter to the flowers to make them sparkle. 2. Decorate the rest of the mirror with sequins, gems, bead, silk flowers, ribbon, rickrack, etc. 3. Cut a small card from card stock or part of a greeting card and punch a hole in the top left-hand corner. Write the following poem on the card and then tie it to the mirror as shown in the picture to the right. ©2011, Digital by Design, Inc. - See Copyright Information - You may link to this craft, but do not copy and post this poem or craft on another web site without permission. 1. Press about one inch of play dough inside the paper cup. 2. 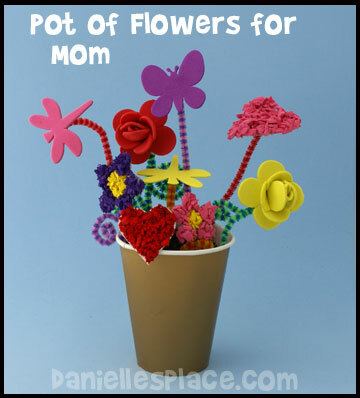 Glue craft foam flowers, hearts, and bug shapes to the pipe cleaners. 3. To make the hearts textured glue the foam confetti to the hearts. 4. Stick the pipe cleaner stems into the clay.